Pack + is a set of features specifically designed to generate energy savings. > Thanks to its automatic selector, the heater indicates the level of energy consumption by positioning itself in front of a color : red, orange or green. In this way, depending on the active operating mode and the temperature set, you can now situate your energy consumption level snapshot beside the recommendations of EST. > The heater has an energy meter allowing it to display an estimate amount of energy that it consumes in kWh. > The device automatically proceeds to a temperature lowering cycle by switching to frost protection mode during aeration of a room. - ECO BOOST (priority to savings): the device operates in permanent Eco mode, with Boost during the programmed periods of using the bathroom. - COMFORT BOOST (priority to comfort): the device operates in permanent Comfort mode, with Boost during the programmed periods of using the bathroom. 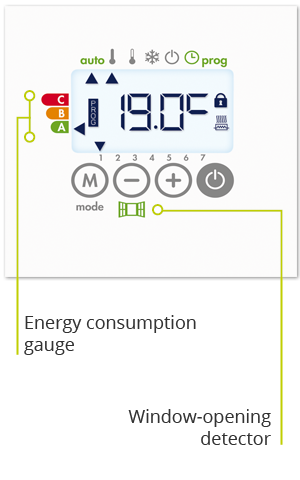 Into this 2 modes, the occupancy detection will cause an automatic reduction of the setting temperature, according to the usual lowering steps. > In ECO BOOST and COMFORT BOOST modes, you can programme 1 or 2 Boosts per day, and you can customized the Boost start time. - Each day of the week: from Monday to Sunday. - On weekdays only: from Monday to Friday. - The weekend only: Saturday and Sunday. > Make also savings on your holidays. You can programme an absence period, during which time your bathroom will be protected against the frost. At the end of the absence period, the Danais + EcoSens® towel rails will automatically return to initial mode, to find the right level of comfort to your return. The right temperature all the time, economy savings. Preset setting temperature to 19°C. 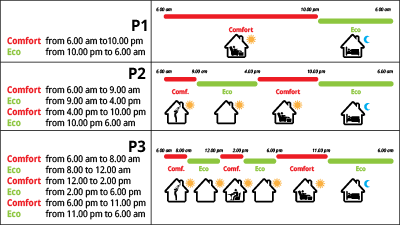 Limit of the time slot adjustment of the setting temperature. The maximum limit of the setting temperature is 19°C. > PIN code locking: the heater is protected by a customized security code which, when activated, prohibits the access to settings reserved for professionals.